Manufactured circa 1917-1929 (based on the pottery mark). Measuring 5.8 inches by 6.7 inches (diameter at the top), this Art Nouveau style jardiniere features a creamy blush ivory background, speckled gilt edging around the rim, and the delicate artisan-painted “May” pattern in vellum that reminds you of summer flowers overflowing out of the pot. The pottery mark announces its authenticity and also gives a clue about its age: this pot is between 86-99 years old. Although not as prized as the Spring pattern, the May pattern is one of the Crown Devon cream-colored vellum lines that are a favorite with collectors. Crown Devon Fieldings rose to popularity in the early 20th century from humble beginnings in 1878. After a rocky start, the company developed a reputation based on their superbly crafted artisanal vellum ware that held a particular appeal for the British Raj-era English middle class. 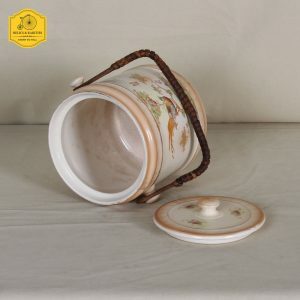 Many of their vellum range patterns are prized by collectors and Crown Devon is now world-famous for these, with many collectors demanding nothing less than its vellum ware. Well-preserved pieces (especially those of the Spring and Royal Devon patterns) can fetch as much as several hundred pounds at auctions and antiques fairs. Crown Devon wares age extremely well in terms of popularity. These ceramics have become increasingly rare as demand for them has surged since the company shut down in 1982. This planter pot has some crazing at the bottom but nothing that impacts its looks. On the whole, it is in excellent condition. 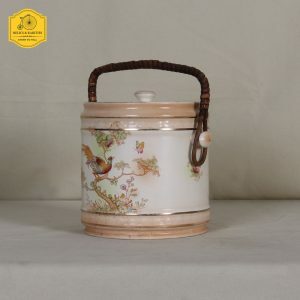 A perfect addition to your early 1900s English or Art Nouveau French decor, this jardiniere also makes for a tasteful wedding gift.